You can follow the steps in this article to integrate your Zentail account with your ShipStation account. If you need a refresher, you can review our article on the ShipStation Integration Overview to learn more about how information is communicated between these two products! Your integrations page controls high level items about your ShipStation integration, like your API credentials, whether to send the Marketplace Order ID, and other account-wide settings. Here's a breakdown of what you'll see when you click on ShipStation. 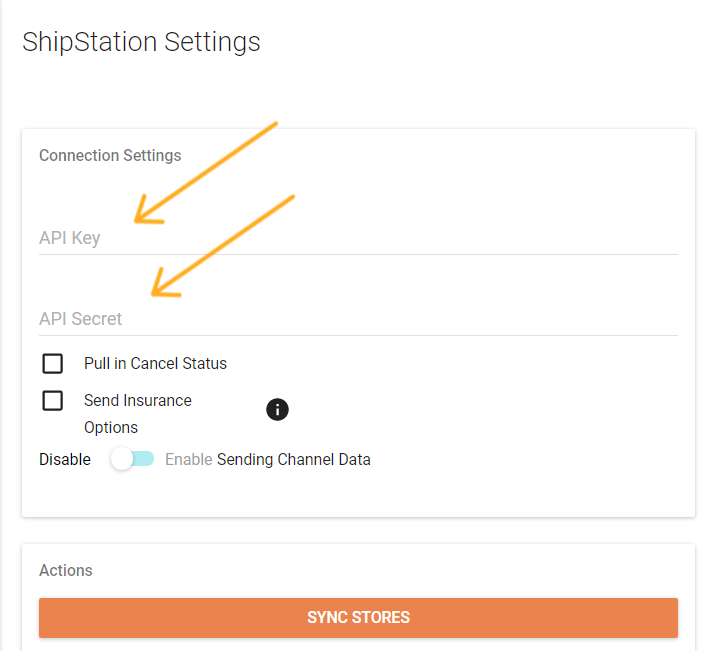 API KEY and API Secret- This is where you'll be able to enter the API credentials from you ShipStation account. Without your API credentials, Zentail cannot communicate with ShipStation. Pull in Cancel Status- This allows you to cancel an order on ShipStation and have that "cancelled" status automatically flow into Zentail. This usually results in Zentail cancelling the order on the Channel/Marketplace too.- It is recommended that you keep this option de-selected (unchecked) and to cancel any orders directly on Zentail. If you cancel an order on Zentail, that update gets sent to the Channel/Marketplace and to ShipStation. Send Insurance Options- This is available for any sellers who need to regularly insure their packages. Usually this is for high-value products.- It is recommended that you keep this option de-selected (unchecked) unless you are sure that you need it. Sending Channel Data- This allows Zentail to send the Channel Name (like "Amazon") and the the Channel Order ID into ShipStation. This is sent into Custom 1 and Custom 2 fields on ShipStation- It is recommended that you have this option selected (checked).- The only reason to keep it unchecked is if you are already using the Custom 1 or Custom 2 fields on ShipStation for another purpose. Sync Stores- This needs to be run anytime you've added new stores on ShipStation and you want them to appear in Zentail. Title- This is what you'd like this integration to be called, like "My ShipStation"
Store ID- This is the ShipStation Store where your orders will be sent in to by Zentail.- In most cases, this is the Manual Store that you've created on ShipStation for your Zentail orders. Head to your Account Settings (the 'gear' or 'wrench' icon in the upper right). If you have not already generated your set of API keys, you will need to generate them here. Important: if a marketplace or third party is already connected to ShipStation this button will break the connection. 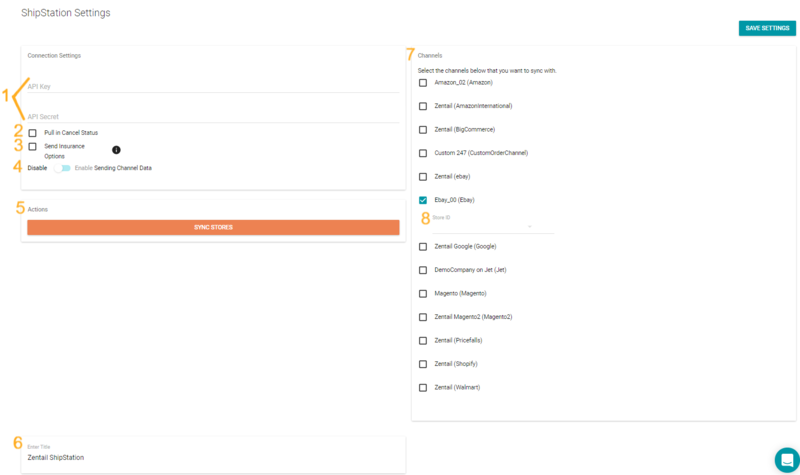 You can either put the new keys in the connected system, copy the keys from that system, or wait until you're ready to go live with Zentail and get these keys then. Copy the API Key from the ShipStation API page. Next, paste it into the API Key field in Zentail. Copy the API Secret from the ShipStation API page. Next, paste it into the API Secret field in Zentail. Follow this section to create a ShipStation Manual Store for each channel you plan on fulfilling with Zentail. This step is done in ShipStation. The first decision you have to make is whether you want all of your Zentail routed orders in one store on ShipStation, or if you want a ShipStation store for each channel. For companies that segment out their order fulfillment workflow by marketplace, you may want to have multiple stores. However, the most common set up is to have all of your Zentail routed orders sent to just one store on ShipStation. On ShipStation, head to your Account Settings (the wrench icon in the upper right). Then, click the Connect a Store or Marketplace button on the right side. You'll see a list of available selling channels. Scroll through (or begin typing in "shipstation") to find and select the ShipStation branded selling channel. From there, you can enter the store name (likely "Zentail" or "Zentail - eBay"). All other fields can be left as is. The last field you'll need to enter is your timezone. Click Create Store and save your changes on ShipStation! Repeat to create as many stores as necessary. After creating all your manual stores in ShipStation, go to the Zentail Integrations Page. In the Actions section of the ShipStation Integration view, Click the SYNC STORES button. In the dropdown that appears below each channel, Select the ShipStation "manual store" that Zentail should send orders to.